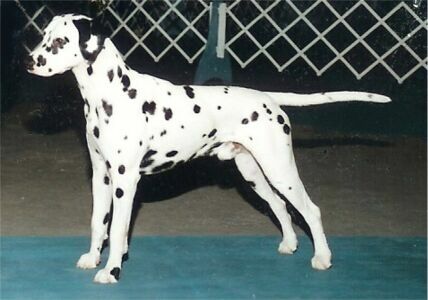 From the repeat breeding that gave us Deeter. Axel (whelped 12/30/98) went to live at Atlantis Dals in New Braunfels, TX. Sweet dog who wants his own audience for his antics. Handsome masculine head with lovely ear carriage, excellent bone, and balanced movement. Axel also produced a BIS winner for Suzi Casey. Unfortunately, Axel was neutered before his full potential as a stud was realized. However, his full brother, CH Thidwick Detour, is still available for stud here at Thidwick.